This is an explanation of the second logic game from Section III of LSAT Preptest 77, the December 2015 LSAT. Six out of eight ceramic bowls will be displayed in a row and will be numbered one through six (1, 2, 3, 4, 5, 6). Each of the bowls was crafted by one of eight potters: Larsen, Mills, Neiman, Olivera, Park, Reigel, Serra, and Vance (L, M, N, O, P, R, S, V). This is a linear game. It’s not an easy game, but it’s not the hardest sort of game, either. The most important thing is having a clear list of the rules, and not forgetting them. There are five rules in this game, and forgetting even a single rule will prevent you from solving questions. The fifth rule can also go on the diagram. 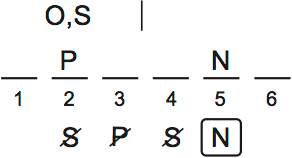 It says that N doesn’t have to be placed, but if they are placed they’re in slot 5. One way to draw it would be to put “N” under slots 1-4 and 6. But that’s too visually cluttered. Instead, I made up a new symbol for this game: N with a box around it, under slot 5. As you gain confidence in your diagrams, I encourage you to come up with new versions like this for situations where the normal diagrams don’t work so smoothly. You’ll probably come up with different diagrams than me, which is fine, as long as you keep them clear and easy to draw. Note that OPS is reversible. It can also be SPO. Also, note that V with a circle just means V is random. I always number the rules that I can’t fit on the main diagram these numbers don’t necessarily correspond to the game rules. They’re just for easy visual reference. I would normally draw two diagrams, one with R in 1st and one with R in 6th. But in this game, there’s a third possibility: no R. So the situation isn’t constrained enough to warrant making scenarios. The final step should be to see if there are any deductions. There’s one: P can’t go third. That’s because P has to go between O and S, and S can’t go second or fourth. (S would have to go in one of those spots if P were 3rd). Numbers are important on this game. There are are eight potters total, and six spaces. Many questions force two people out. That means everyone else is in. See question 8 for an example. That’s from question 7. The purpose of this diagram is to more quickly represent that OPS/SPO fill slots 1-3, in either order. I could draw them in a box with a reversible handle, but this method is faster, and that’s important. I’ve written elsewhere about the benefits of repeating games, to solidify your intuition for deductions. Note that the purpose of repeating games is to prove the answers right, so it doesn’t matter if you remember the right answer. I repeated this game about three days after I first saw it, by which time I had forgotten the answers. I’ve written how long it took me on the second attempt. That time, or a couple minutes above it, is roughly the standard you should be aspiring to – a lot of people take 8-9 minutes on a repeat attempt, get everything right, and pat themselves on the back. But that’s too slow. The faster you go when repeating, the faster you’ll learn to go the first time you see a game. Note that I had only done part of this game prior to repeating, so my time is probably a bit higher than it normally would be. This game is medium difficulty, rather than hard. Hi! Thanks for all your helpful explanations. Question: When you say, “Note also that, after I wrote these explanations, I figured out that OPS/SPO always have to be in” — don’t questions 8, 10, and 11 contradict this? OPS/SPO don’t always have to be in: of those three elements, only O and S must be in. Yes, that’s correct! Thanks for your comment, and the page has been updated. I’ve been finding your explanations to be extremely helpful overall, thank you! Unless I am misapplying this statement to the game as a whole, it seems to have slipped through the cracks during editing. Yes, thanks for catching that! The page has been updated.